Big Sur Marathon Training: Week Six | Fit Girl. Happy Girl. I can’t believe I’m already halfway through my training for Big Sur! I know it says I’m only at week six, but I picked up the training program two weeks in so I’m really at week eight. Since it’s the halfway point, this week was a cut back week in terms of mileage and long run distance. I thought this would be a much needed break, which it really was, but my long run ended up being a lot harder than I had expected it to be- and it was “only” 12 miles! I ran my runs in my new Brooks Ravenna 4s and I really like them. I was desperately in need of new shoes, and was having the ankle pain to prove it, so it was good to get in some new kicks. Monday: XT – Today was a cross training day so I went to metabolic boot camp. It was no repeats Monday which means we did 4 circuits of 5 different exercises. I felt really good though! Tuesday: Easy 5 miles in 46:38 minutes at 9:08/mile. Today was my first run wearing my new Brooks Ravenna 4s and I really liked them! I maintained an easy pace- legs were a little sore after last night’s bootcamp- but overall the run was really good. It was actually kind of warm out which was a nice change! Wednesday: 8 miles total for the day, split up in two different runs. Run 2 of 2: 2.6 miles in 24:00 at 9:13/mile. This run was super easy and on the treadmill at the gym. Felt good the whole time. Thursday: “easy” 3-mile run in 24:30 at 8:09/mile. Also, I went to a 45 minute gentle flow yoga class after work. I’ve been trying to incorporate much more yoga into my training and so far it’s definitely helping. Saturday: 12 miles, long, slow distance. 12.35 miles in 1:58 at 9:33/mile. I felt kind of sick to my stomach during this whole run. I think I might not have given myself enough time between breakfast and when I left for my run but I just felt gross. Also, I went to bed way too late last night and was really tired. My splits were less than impressive and I had to walk a few times. 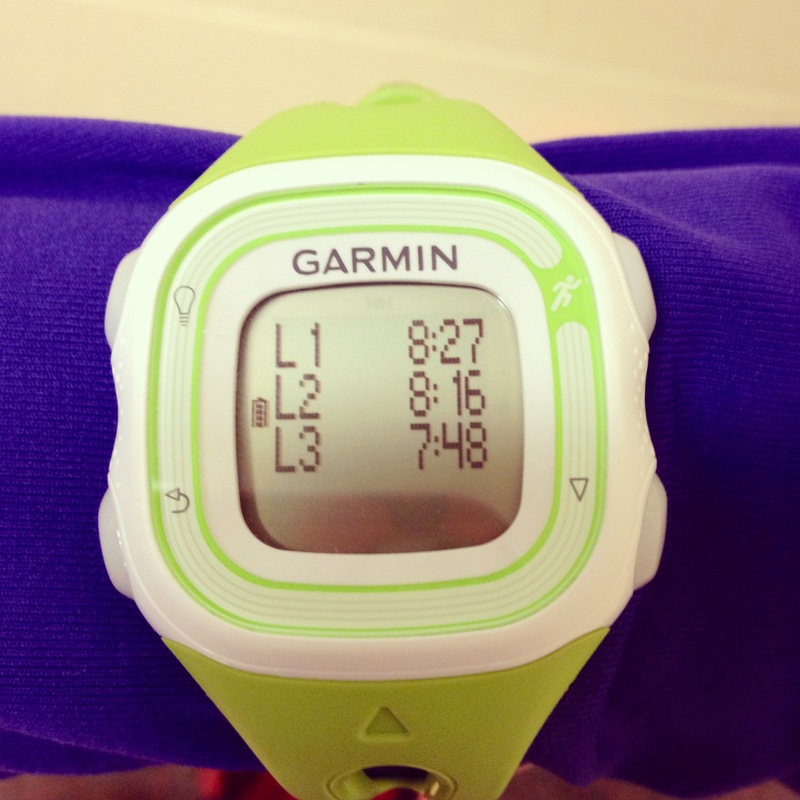 Why does it seem like the shorter long runs are harder than the long, long runs? (11) 10:09 – eek #2! Also, I did a 10 minute post-run yoga workout by lululemon. Sunday: easy 3-mile shakeout in 29:00 at 9:39/mile. I ran with my friend Cassie and although it was pretty cold at first, we warmed up quickly and had a great run. I finished the day with a short post-run yoga sequence. See all training recaps here. Congrats on hitting the half way point! Looks like your training is going really well. And you’re smart to build in hill workouts, too. It’s so flat here, I’d have trouble finding hills, but you need them for Big Sur! Thank you! I’ve really been forcing myself to do the hill workouts, even though I hate them! But I think it’ll pay off in the end. I’ve always wondered what people who live in flat areas do for hills. When I was training for my first marathon last year I remember being SO excited for my long runs because it actually gave me a reason to go out and just adventure for 2 or 3 hours. As the race got closer and people asked how I was doing I remember saying that it was going well, but it would probably be only full marathon because “the training was so grueling”. I felt that way up until race day, but as soon as I started running that first mile I knew I was hooked and that the training was totally worth every step, now I’m pumped for the next marathon I get to train for! I’m excited to read all about your journey. You’ll get there and your hard work and dedication are absolutely going to pay off. Keep up the great work and always run with a smile!